River-bank thickets and wet calcareous Great Lakes shores. Our plants are referred to var. confine (Fernald) B. Boivin, sometimes recognized as T. confine Fernald. Variety venulosum of farther north and west has thicker, more veiny leaflets. In var. confine, the leaflets are very similar to those of T. dioicum, and the upper leaves may have a relatively short petiole; however, the fruit is longer and more prominently beaked than in T. dioicum, and the undersides of the leaflets, many descriptions as glabrous notwithstanding, are usually at least sparsely glandular. Although less glandular than T. revolutum, such plants may be confused with that species. Thalictrum revolutum arises from a short erect underground base, while T. venulosum has an elongate horizontal rhizome. When this species grows adjacent to T. dasycarpum the two apparently hybridize. Intermediate plants may have the leaflet shape of T. venulosum but without glands and with multicellular hairs, as in T. dasycarpum. MICHIGAN FLORA ONLINE. A. A. Reznicek, E. G. Voss, & B. S. Walters. February 2011. University of Michigan. Web. 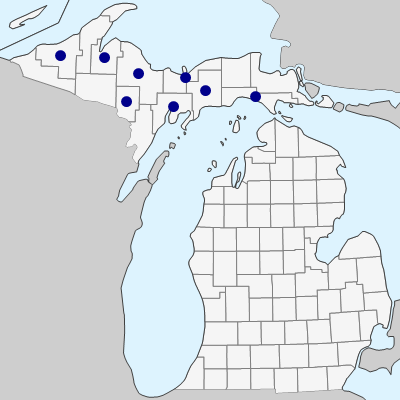 April 21, 2019. https://michiganflora.net/species.aspx?id=2406.